Welcome to Kangaroo Creek Farm. We look forward to your visit! We are open every day, seven days a week, including the weekends and the holidays, from 10 a.m. to 3 p.m., rain or shine, up to and including the Thanksgiving long weekend. We are still at 3193 Hill Road in Lake Country. We are planning a move, but it won’t be any time soon. Once we have a firm relocation date we will post it on the website, the facebook page, the recording on the answering machine, and in the newspaper. We are only (eventually) moving 5 minutes away so it won’t be a big deal. Why are we moving? Because we need more grazing and (especially) more PARKING. It’s not just Costco that’s having issues 🙂 Our new facility will be considerably bigger, have much better access, and upgraded services such as debit and credit. We are going to retain the current theme: A natural farm setting, populated by happy animals and birds, without any Disney-fication or hyper-commercialization. Adults $10, Youth (under 19) $5, Seniors (65+) $5, Children under 5 free. Admission Rates have not changed. Save 50% on adult admission by purchasing a punch card from Olive Us in Lake Country or Vernon between November 1st and March 1st. We will no longer be offering them for sale at the farm. We gratefully accept cash, unfortunately, we do not accept debit or credit cards at this time. We reserve the right to change our fees without notice. The admission fees posted on the website at www.kangaroocreekfarm.com take precedence over any out of date advertising. We appreciate your support! Your Admission keeps our farm staffed and running smoothly. Open every day, 7 days a week, including the weekends and holidays, from 10am to 3pm, rain or shine, up to and through the Thanksgiving long weekend in October. We look forward to seeing you at the farm. We are still at 3193 Hill Road in Lake Country. We are planning a move, but it won’t be any time soon. Why are we moving? Because we need more grazing and more PARKING. Our new facility will be considerably bigger, have much better access, and upgraded services such as debit and credit. Admission Rates have not changed. We gratefully accept cash, unfortunately, we do not accept debit or credit cards at this time. We reserve the right to change our fees without notice. The admission fees posted on the website at www.kangaroocreekfarm.com take precedence over any out of date advertising. We appreciate your support! Your Admission keeps our farm staffed and running smoothly. Please remember that commercial groups must book by email at info@kangaroocreekfarm.com We cannot make commercial bookings by phone. Please go to our Group Visits page for more information. Our animals insist on their afternoon nap, the staff go home at 3:00pm, and our insurance agent says he won’t continue to renew our liability insurance if we don’t stick to schedule. Sorry, I know our hours are inconvenient to some people but we have to make the welfare of the animals paramount. By 3:00pm they’ve simply had enough. Head to our facebook page to stay up to date with news, events and happenings at the farm. 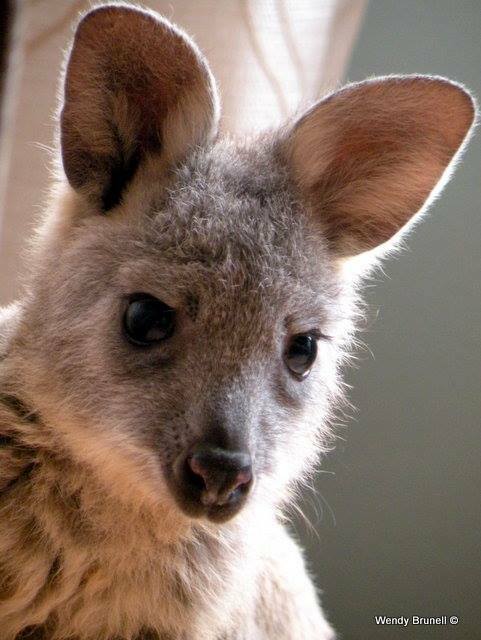 We have been keeping kangaroos and wallabies for more than 20 years on our farm in Lake Country near Kelowna BC. 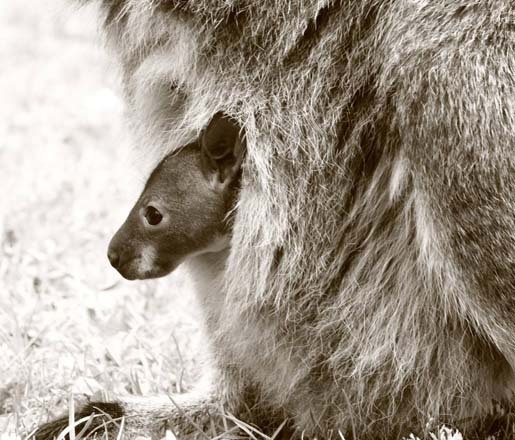 We do not promote them as house-pets but rather as alternative hobby farm pets to very specific types of situations.We currently have Red Kangaroos (the largest type of kangaroo), Common Wallaroos and Bennett Wallabies (which are mid sized), and Dama Wallabies (one of the smallest wallaby species). Also on site we have emu, peacocks, fancy chickens, goats, parrots, a baby albino wallaby, baby kangaroos and potbellied pigs. We also have capybara, the world’s largest rodent, which can weigh more than 150 lbs! Visitors can enjoy wandering amongst the kangaroos. Our staff are very knowledgeable about kangaroos and wallabies and are on hand to answer any questions you might have about various species, habitat, breeding, diet, housing and general physiology. Your visit can be as educational an experience as you choose to make it. This is a very special, free activity that we try to provide to our guests to the best of our ability. The perfect visit in regard to short waits and extended snuggling happens during the shoulder seasons. If you can avoid the weekends and the holidays that’s even more optimal. Visitors that come during these periods can often sit and hold multiple joeys for as long as they please. Thanks, and see you at the farm! 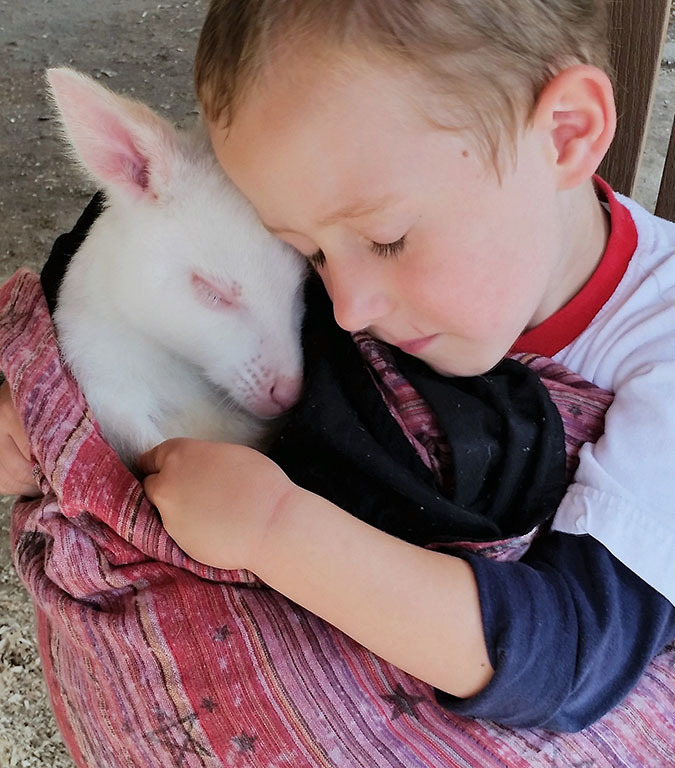 Kangaroo Creek Farm prides itself on being as non-commercial as possible. We like to keep things real and un-Disneyfied. You won’t be asked to exit through the gift shop because there isn’t one. There’s a small unobtrusive pop/ice cream stand being run by our teenage son but that’s about it for commercial enterprise once you’ve paid your admission at the gate. You won’t be asked to pay extra for treats to feed the animals (our guides hand them out). We don’t charge extra for holding a joey, a sugar glider, or the parrots. However, the last 3 activities I mentioned are not a guaranteed activity. They are an extra something that we try and provide to the best of our ability but there are only so many joeys, so many sugar gliders, and so many parrots. Sometimes the farm is very busy and we simply cannot accommodate everyone. If you choose to participate in these extras that we try and provide then it is possible that you might have to line up, wait, and be patient. A good way to avoid having to wait or put up with large crowds is to come in the off season, avoid the weekends and the holidays, and peak times of day. Commercial groups and clubs such as schools, Home-School groups, Boys and Girls Clubs, YWYMCA, daycares and institutions must email to book a day to visit. Visit our Group Visits page for more information. This is important! We are happy to invite Lake Country retirement homes, schools and daycares to visit us for free as part of our community service but we have to draw the line somewhere. To all the groups, clubs, schools, daycares and organizations that have contributed, Thank You! Please read the The Farm page and The Rules page before you come out for important additional information.